Spring rolled around and I gave a good friend of mine a call to help me with my problem, Wes Atkinson of Atkinson Expeditions. After talking to him for a while he proceeded to tell me how an antelope with a bow was one of his harder hunts. Now I know that I heard him, but I don’t think I was listening. We set the dates for the opening three days of the season and despite his warning I already had a spot picked out on my wall. We were hunting over water after all. The two weeks prior to the hunt I was completely useless both at home and at the office - counting down the hours until I would take my first antelope. The season opened on Sunday and I had three days to hunt. Saturday afternoon I left for eastern Colorado. After arriving at the hotel I met Jerome, my guide, to go over what to expect in the morning. He told me of all of the rain the week before, all of the standing water and showed me pictures of a flash flood on his trail camera. I asked him if there was any good news, he paused and said “There’s lots of goats.” Even after all of the bad news I hadn’t lost my enthusiasm. I was going to wake up in the morning and take my first big game animal of the season. The alarm went off at 4 AM but I was already awake. I grabbed all of my gear and went outside to meet Jerome. As I walked out of the hotel door my heart sank, it was raining, and there was lightning in all directions. It was cold. I was sick. Now I know that antelope hunting over water is easy, but I wasn’t sure how thirsty they would be during a thunder storm. I was the last hunter to be dropped off, and as we rode around the property I noticed a disturbing trend, water every where. To give you an idea of how much water I’m talking about, my personal little water hole had stretched to 92 yards across. If a goat were to water he would have to come to my side of the ocean. As the sun started to rise, Jerome’s words rang true, there were antelope everywhere. The bad news was they were all a mile away. As noon rolled around I started to get antsy. I’m used to sitting in a tree stand for morning and evening hunts and I had only been in the blind for 7 hours. I still had 8 more grueling hours to go. Mentally I started to second guess myself, could I really do this, sit all day long, for three days? So I sat, played video black jack, ate a PB&J, drank some water and watched time tick by slower than I’ve ever seen it. The only thing that even came into rifle range was two coyotes and a stork. The sun set and Jerome came to release me from my cell. Needless to say it was a quiet ride back to the hotel; we were all exhausted and depressed. Once back in my room I talked to my wife about the next day’s weather. It wasn’t good, more clouds and rain. I went to Jerome’s room to talk to him and discuss my options. There was no way I could take another 15 hours in the blind knowing they were not coming to water. It doesn’t matter how many antelope there are or how good your guide is, you’re at the mercy of Mother Nature, and if she decides that it’s going to rain, you’re in for one tough hunt. Lucky for me, I live in Colorado, and had the entire season to hunt. Jerome and I decided to try a spot and stalk in the morning then I would leave and come back later in the season when things dried out. Two weeks had passed when I got the text from Wes about a hot water hole that the antelope were using. I couldn’t make it up that day due to work but I was there two days later. We met in the morning and he told me what he was seeing. The water hole was still being used, just not as much. The other good news was his other hunter was having shot opportunities every day. My enthusiasm was back. We drove around the ranches looking at our options when we found “Blondie” bedded next to a dry creek bed. Two hours went by when Wes sent me a text telling me the other hunter had just shot one. I was getting excited even though I hadn’t seen anything. It was a toasty 97 degrees outside the blind. 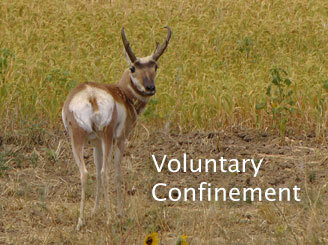 Around 4 o’clock, I saw my first antelope, two does and a small buck, I’m not even sure he was legal. They came in and drank exactly where Wes said they would. I could actually hear them slurping the water. That was the closest I’d been to a live antelope. Wes picked me up just before dark and we decided that I would come back by my self Saturday and hunt the same blind. I drove up Saturday morning and climbed in the blind around 7:30 and got situated. It was a slow morning until just after 10:00 when I saw two bucks at about 300 yards walking parallel to me. One of the bucks was very small and the other was big enough to shoot - for sure. I slid on my black face mask knowing that they had to be coming to the water. As they continued to walk away from me and out of my life, I started to get that sick feeling again. I had been sitting in a blind for three days and had not had one legal buck in bow range. I was ten pounds lighter from all of the water weight I had lost from sweating and the flies would not leave me alone. Once again, Wes had sent me another text earlier that morning telling me his other antelope hunter had taken his goat fifteen minutes into his hunt. It seemed like I couldn’t catch a break. I slid off my face mask, had a sandwich and played some more black jack. It was 11:30 when I remember looking up and seeing those same two bucks standing at 150 yards and coming straight to me. This was the moment I’d waited for and thought about all year. I put my mask back on, turned on the video camera and got into position. They both walked to the water but at the last minute the older buck walked past me to a little mud puddle 120 yards to the left. The little one drank at 30 yards. I couldn’t believe it. The little one proceeded to drink for five minutes as the bigger one watched from a distance. As the smaller one finished the mature buck turned and started walking in. Just as he got to the pond bank something was wrong. I’m not sure if they caught my wind but they both jumped and trotted away. He finally stopped and turned broadside and I was able to range him. I drew my bow picked a spot and let go. I distinctly remember the sound of that arrow as it struck home. Even though he was running, I could see that the shot was perfect. His sprint was a short one as I got to watch him fall inside 100 yards. I had done it, finally! I can’t properly explain how excited I was, but I was a wreck. I called Wes, my wife and then my father to share the good news (just in case you ever talk to my wife, I called her first – Ok?). I then went to my buck to soak it all in, he was beautiful. Clint Morrow is all smiles after his hard-earned prairie goat! That is the story of my 2010 antelope hunt. I can’t wait to subject my self to voluntary confinement again next year, because after all, bow hunting antelope over is water is easy right? Clint Morrow is a chiropractor with a private practice in Parker Colorado. He is also a high school wrestling coach. 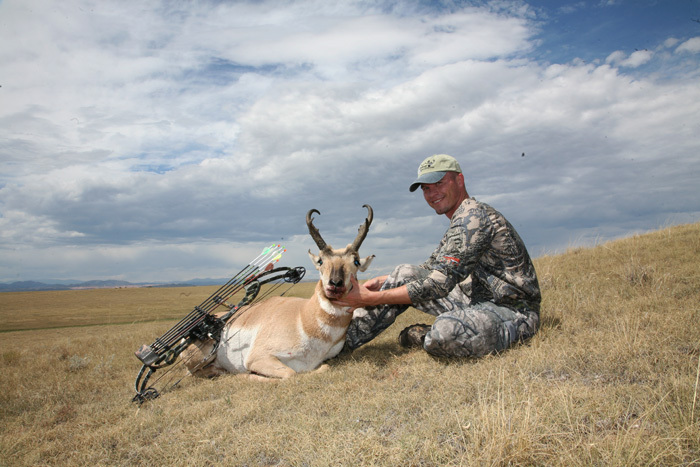 Clint was hunting antelope with Wes Atkinson of Atkinson Expeditions. Clint is a regular visitor here at Bowsite.com.